Is A 6 Cylinder Toyota Mini-Motorhome Powerful Enough To Go Up Hills With The A/C On? The answer to your question is yes, you could have problems climbing hills with the A/C on in a Toyota powered motorhome. It all depends on what size Toyota Motorhome you are talking about. You do not tell me what RV manufacturer made the Toyota motorhome you are asking about. You also do not tell me what length the motorhome is. A basic rule of thumb is the longer the Toyota motorhome is and the more weight you carry the more you will notice a lack of power when climbing hills with the A/C on. Here is the problem; Toyota motorhomes are motohomes that were built by US RV manufacturers on Toyota Truck Chassis starting in the early 70s with the last ones being built in the early 90s. During that time there were close to 30 different RV Manufacturers that built these mini-motorhomes. Even some well known manufacturers such as Chinook, Coachman, Itasca and Winnebago at one time or another manufactured these mini-motorhomes. Motorhome could have a big problem going up a hill with the A/C on and yes it could be very irritating to drive one. The only foolproof way of finding out how a particular mini-motorhome will perform is to load it up and test drive it up a hill with the A/C on. For those of you who are not familiar with what the inside of these mini-motorhomes looked like take a look at the video below. This video is of the inside of a 20 foot Toyota Mini-Motorhome that was manufactured by Winnebago. If you are interested in more information about Toyota Mini-Motorhomes you should visit Toyota Motorhomes.com. 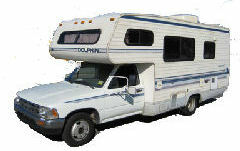 This website has all kinds of information on Toyota Mini-Motorhomes. They also have a forum where Toyota Mini-Motorhome owners can share information with each other. I hope that this information has been helpful to you. If any of our visitors have suggestions or tips for you they can add them to this page by clicking on the add a comment link located near the bottom of this page. Comments for Is A 6 Cylinder Toyota Mini-Motorhome Powerful Enough To Go Up Hills With The A/C On? I have a 1983 Toyota Odyssey Americana mini. I drove over the Continental Divide while running AC in the cab. I have the V6 EFI engine but the reason I could do that was the Electronically Controlled Transmission (ECT) button on the dashboard. ECT keeps the truck in a lower gear when needed. It revs the engine a little but it gave me power to get over The Rockies! ANSWER Greetings Rick, I did not tape that video, it is from YouTube.com. I believe that the person was trying to sell it at the time. I do not know if that is still the case.